Decorate your desk with a stack of bricks. These mini, Made in the USA construction materials are just like the big ones—except they’re a sixth (sometimes a twelfth) of the size. The tiny cinder blocks, wooden pallets, red bricks—even the mortar—are all made from the same elements as the real-life ones. These small but substantial materials make a fun desk toy, entertain tinkerers, and are raw matter for avid DIY-ers. Whether you’re fidgeting with the blocks, using the wooden pallet as a coaster, or using the cement to build a pen holder, Mini Materials take construction materials to a whole new, easy-to-handle scale. Hey Grommet Fans, my name is Erik and I'm here to introduce you to Mini Materials and answer any questions you might have! this is such a great item. It would make an awesome gift for our upcoming groundbreaking ceremony for an apartment construction project. Is this something I can get in quantities of a few hundred? Give me a alternate contact if necessary. @Hekemian If you're interested in an order of that size, email [email protected] Our custom and bulk order team will be happy to help! @Erik Great idea for making architectural models. But you should add some fly ash and or styrofoam fines to your mix before pouring into molds to reduce the weight. Because if they are made of standard cement, the weight will become significant. Too much. @David We have tried to make them lighter, but unfortunately it compromises the integrity when we are dealing in such small scales. We had to stick with a hardy cement-based mixture. Thanks for the advice, and we will take that into consideration as we continue to improve our products. Hi Erik! I'm an avid DIYer and I use cinder blocks for lots of projects. I don't understand the mini blocks. What would I do with them? @Kathy Hi Kathy, There are tons of different DIY projects that you can use them for. Many people buy them to build architectural models, train models, and diorama builds. We have also seen them used for fairy gardens, or even to build a cell phone charger holder. 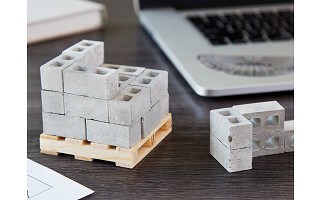 The 1:12 scale cinder block kits come in two packs: a 50 pack and 24 pack (with miniature wooden pallet). The 50 pack is more for building, that can be built with our mortar. Most people that buy the 24-pack use it for a desk accessory. @Kathy I'm a DIYer too and if you're like me, a visual representation of the project helps to ensure you're getting exactly what you want as the outcome. I think you could use these blocks to build a "to scale" model of your next project before breaking ground. 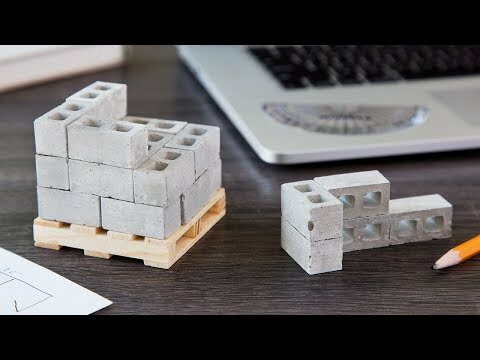 @Stacy That is a great idea since our products are exact miniature replicas of actual cinder blocks! They are even made of real cement. Thanks for the input Stacy! @Erik Thanks for the response. I kind of thought that I could use them to work out project ideas but I wasn't sure. Also the video didn't make that suggestion so I wasn't clear about the use. How much do they weigh. Real cinder blocks are very heavy. Are these heavy for their size? Also will they scratch/harm my desk if I keep them on my desk at work? @Kathy No problem! 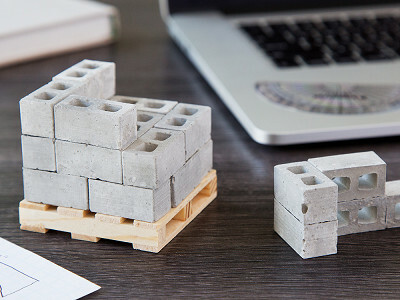 Each of the 1:12 scale cinder blocks weigh about 12g each, so they are heavy for their size due to being made of real cement; however, not nearly as heavy as the life size cinders. :) (The 1:6 red bricks are a tad heavier.) The 24-pack of 1:12 scale cinders come on a real pine wood pallet. As long as they are sitting on the pallet and not directly on top of your desk it should not be an issue. We have never had any complaints! Hope that helps! @Erik you could also place a felt piece underneath to protect surfaces. I think people into miniature building will go crazy over these! That's a great idea @Connie! We hope they are a hit too! @John Hi John! These would be perfect for you. They are all made of the real materials that you would see with the life size versions. There are four choices of products being sold on the Grommet. We have the 1:12 scale cinder blocks - a 50-pack of cinders and a 24-pack of cinders (this one comes on a pallet). We also have 1:6 red bricks which also is a pack of 24 and comes on a pallet. In addition, we have cinder block mortar to help you build your models. 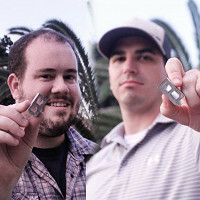 @John We don't offer many discounts on The Grommet, but you can get free shipping on any order over $50. In addition, we have our Grommet Perks Program, where for $25, you can get 10% off and free shipping for the rest of 2017. You can read more about that here. @Laurie He sounds like the perfect customer for our products! We toy back and forth between which name to use, cinder block or CMU. We hope he enjoys them! Can you tel me the exact dimentions of a single cinder block, and a single brick? @Lisa Hi Lisa! Thanks for your inquiry. We have some wonderful social media channels that show what customers have done with our product. Many customers have used them to for architectural models, dioramas, fairy gardens, etc. The dimensions of both the 1:12 cinder blocks and the 1:6 red bricks are 1.33in (l) x 0.66in (d) x 0.66in (h). The pallet that the 24-packs sit on is approx. 2.75in x 2.75in. Hope this helps! You've provided a great description of the blocks. The only thing I'm wondering now is if they are like mini versions are they dusty and kind of crumbly like real ones too? @sheri Thank you! We appreciate that. :) They have a similar texture to real cinder blocks; however, these miniature versions hold up a lot better. They are not crumbly at all, and definitely not dusty. Decorate your desk with a stack of bricks. These mini, Made in the USA construction materials are just like the big ones—except they’re a sixth (sometimes a twelfth) of the size. The tiny cinder blocks, wooden pallets, red bricks—even the mortar—are all made from the same elements as the real-life ones. These small but substantial materials make a fun desk toy, entertain tinkerers, and are raw matter for avid DIY-ers.